register here for this 45 minute webinar on March 20! By attending this webinar, you will learn how to use multi-body dynamics (MBD) simulation tools from the Altair HyperWorks CAE suite to improve the design and performance of your student race car. 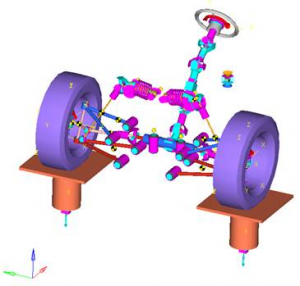 By using Altair’s academic vehicle library, you can adapt suspension models to represent your existing half or full vehicle and make virtual changes to the design in order to improve stability and manoeuvrability. Navigate race courses with ease by simulating and optimizing your suspension design. Spoiler alert: Our MBD expert will also demonstrate how to optimize the suspension system to meet quantitative handling performance targets using Altair’s multi-objective optimization tool called HyperStudy. Sign up now to learn dynamics simulation techniques used by professional motorsport engineers!